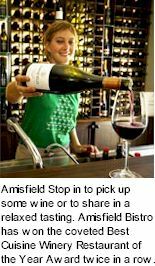 Amisfield Vineyard is located 7km north of Lowburn near the shores of Lake Dunstan in Central Otago, New Zealand. Originally a high country merino stud nestled between Amisfield and Parkburn streams, planting commenced in 1999, and now consists of 60 hectares of Pinot Noir, Pinot Gris, Riesling and Sauvignon Blanc. The vines are close planted on a range of alluvial and glacial schist soils imparting balance in the vines growth and productivity. Yields are kept low to provide concentrated fruit flavour with complexity derived from the range of sites within the vineyard. 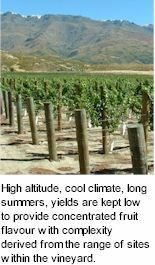 High altitude, cool climate, long summers, and clean soils allow Amisfield to produce some of the best Pinot Noirs and aromatic white wines in New Zealand. The superb Central Otago environment combined with the passion of the winemaking team is the secret behind high quality wines. A new state-of-the-art-wine production facility was completed in March 2006 in time to process 400 tonnes of grapes in its first season. The purpose built facility at the Lowburn vineyard has a 600 tonne capacity and centres round a cuverie for Pinot Noir production. The two level rustic agricultural style complex incorporates leading technology and further stages are planned to cater for increased production and eventually a packaging plant. Two high-tech wine presses have been installed, the same model used in the majority of vineyards in Burgundy in France. A custom built recycled waste plant which is the first of its kind used on a New Zealand vineyard means all waste from the winery is channelled through aquatic plants established in a wetland area. All Winery waste is recycled and this reflects our commitment to sustainability. The overriding winemaking philosophy revolves around the fact that quality wine is grown not made. A blend of ancient and modern winemaking techniques ensures the wines are true to their site, climate, cultivar and culture. Winemaking techniques reflect this in harvest, fermentation and ageing, again utilising natural processes to reflect site differences between individual sites within the farm. The vineyard team's approach to viticulture embraces sustainable agricultural practices where management inputs work with nature rather than against. As such the winemaking approach at Amisfield is one of minimal impact on the extraordinary fruit produced from season to season making the wines a natural expression of the land from which they are created. Single vineyard and 100% estate grown, the Amisfield brand is reserved for those wines which are able to provide a level of distinguishable quality that has become part of the Amisfield philosophy. Taking its name from the location of the spectacular winery and bistro on the shores of Lake Hayes, the Lake Hayes range of wines offer clean, fruit driven flavours that deliver consistent quality and style. The Arcadia range delivers sparkling wines made using traditional bottle fermentation aged on lees for three years. Disgorged regularly, this 'boutique bubbles' offers a complex Methode Traditionelle from Central Otago. Amisfield Bistro at Lake Hayes in Queenstown has won the coveted New Zealand's Best Winery Restaurant Award in the 2007 Cuisine Restaurant of the Year Awards, the second year running, reflecting the quality standards of the casual yet sophisticated establishment. Continuing the principles of Amisfield's winemaking philosophy, Grown Not Made, the country style bistro provides a daily changing menu of organic and locally sourced produce.